Traveling Gypsies | how's it going, eh? We are officially in the province of Alberta!!! The homeless gypsies have arrived. Watch out Alberta. No one is safe. Yesterday morning I sat with my nephews Matt + Tobin while they had their breakfast. 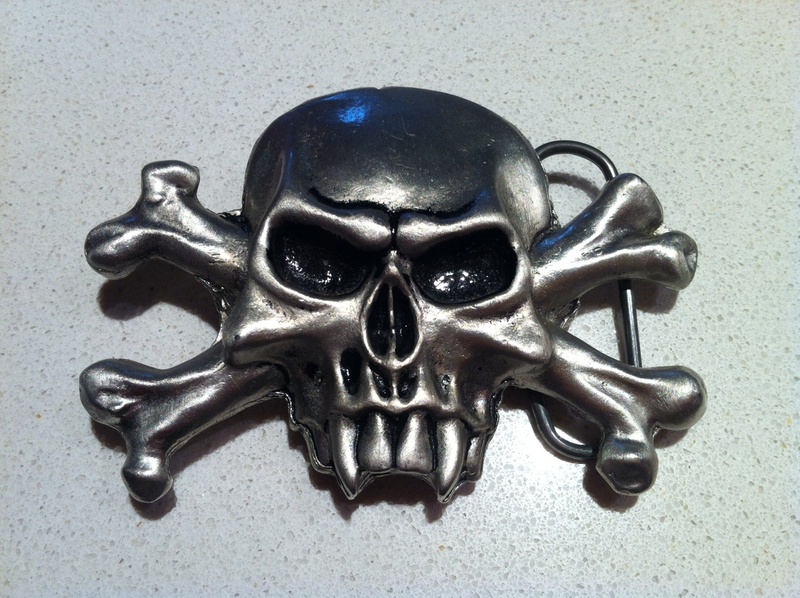 Jeff had given Tobin one of his belt buckles because he knew Tobin liked it. It is in the shape of a skull + when I asked Tobin what he was going to name the skull he said, “Shelli”. After getting over my surprise + delight of being compared to a symbol of piracy, I asked Tobin why + he replied, “Because that was you yesterday. Aaaaaaaangry.”. Wow. So astute, these young minds. Tobin probably picked up on my rage the day before as I vented to Deb about having to constantly move Jeff’s belongings all over western Canada. I thought Tobin was preoccupied with his Lego set. Note to self: children pick up on everything, even when you think they’re not listening. 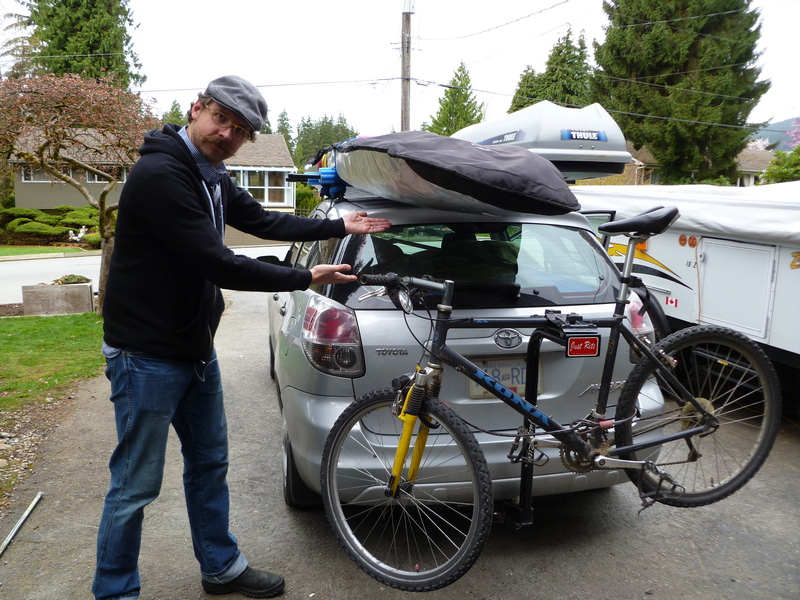 Packed car, packed Thule, paddle board + bike. Au revoir, Vancouver, we may commence our 11 hour drive. Jeff said the past couple nights I was grinding my teeth in my sleep. That means I’m stressed! I’m happy to finally be packed up + on the road, that’s for sure. 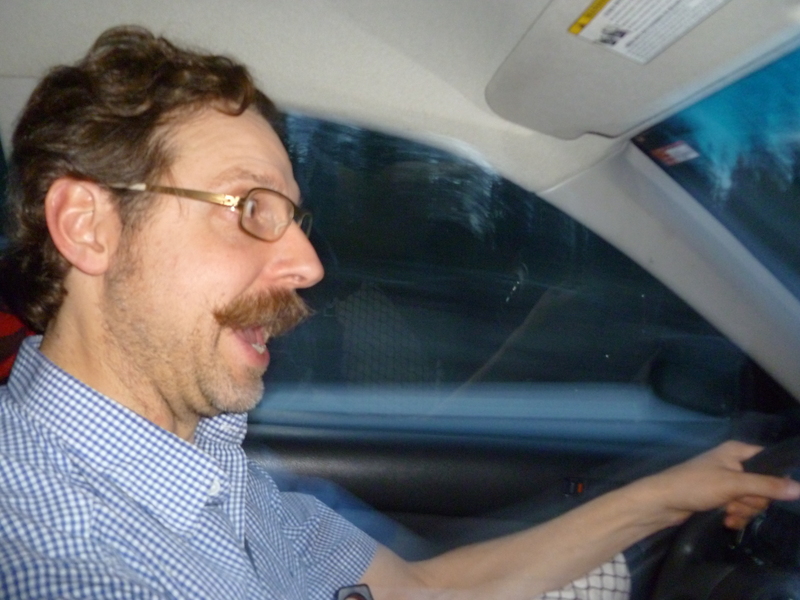 Here’s Jeff in his drive-to-Alberta mode. 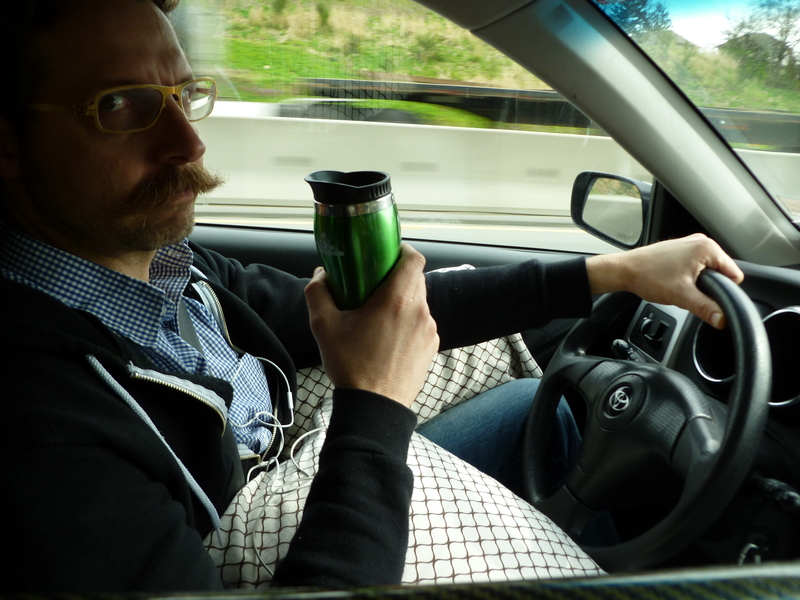 He surrounds himself with pillows when he drives because it’s comfy. Isn’t that just precious + weird?! Obviously not amused that I’m revealing his unusual habit to the public. We stopped along the way to Tim Horton’s. If you visit Canada, you will become friends with Tim Horton’s. It’s Canada’s biggest coffee + doughnut fast food chain. The first time I went there was without Jeff + I ordered doughnut holes. The girl looked at my like I was an alien moron. 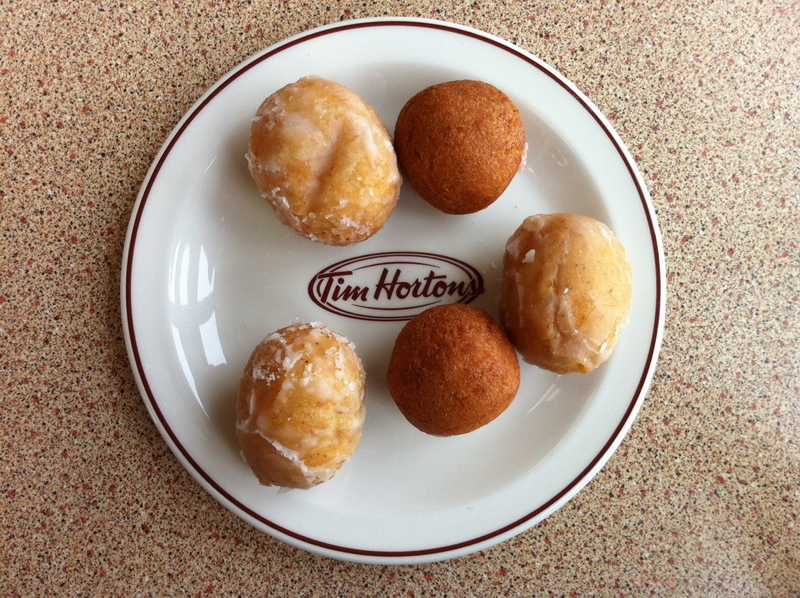 They’re called “Timbits”, y’all!! Learn it! Love it! Also, Jeff ordered a “Double Double”. I was like, “WHAT?! It’s 10:30am, isn’t it a little early for a hamburger?!”. My friends, if you’re Southern Californian, a double double is a double meat, double cheese hamburger from In-N-Out. At Tim Horton’s it’s a coffee with two sugars + two creams. So, don’t go to Timmy Ho’s (as Canucks fondly call it) + think you’re gonna get yo’self a juicy burger!!! Oh Canada, so similar, yet so different…. 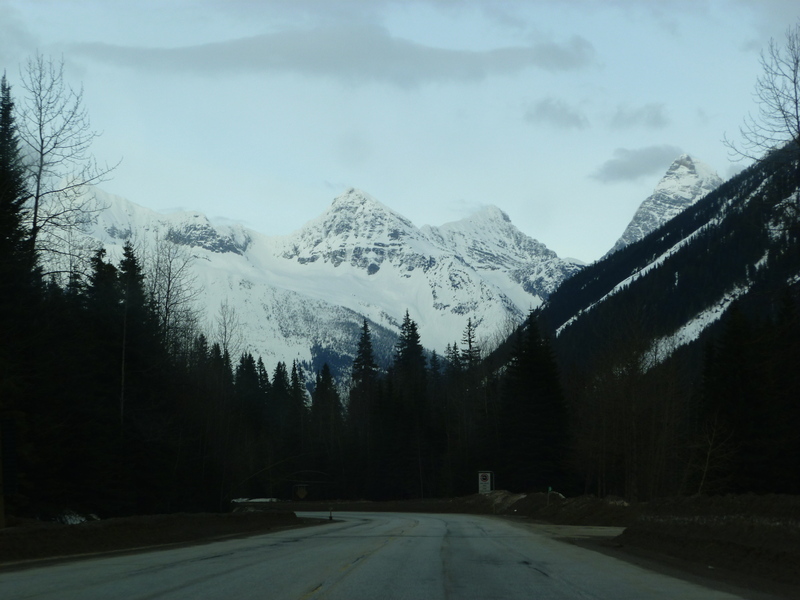 As we drove east towards the mountains, you’ll see more + more snow sheds. 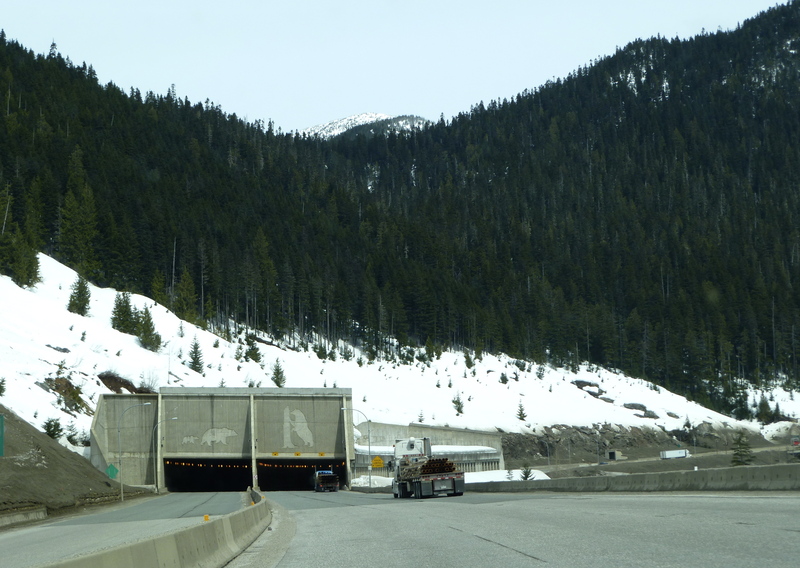 These structures protect the roads from avalanches. Yikes. At one point, I looked up in the sky + yelled, “Jeff!!!! There’s a ring around the sun!!! What does that mean?! Are we going to die?!”. I got an eye roll + no response. 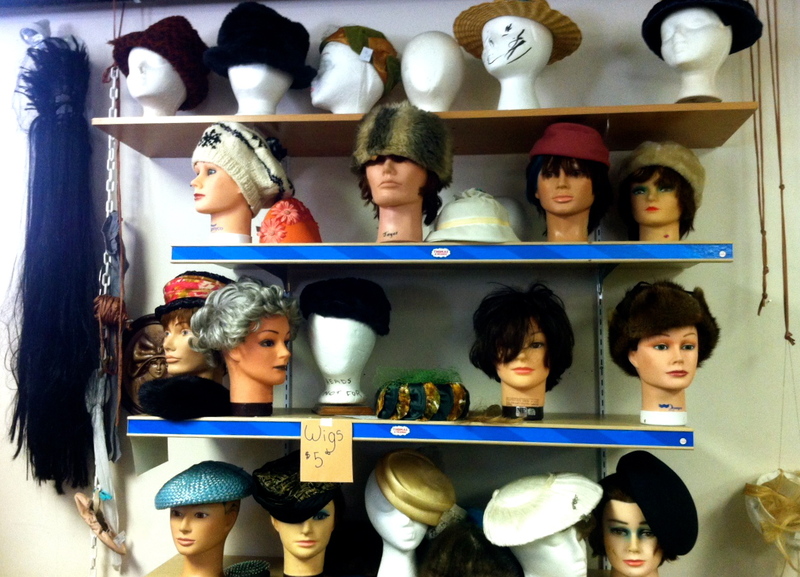 A slight detour on our road trip would not be complete without a visit to a…….thrift store!!!!! Yes, call me an enabler, but I have a bit of the hoarding bug as well!!!! Under the hoarder oath, I cannot reveal the location of this gem. Mwa ha ha haaaa!!! 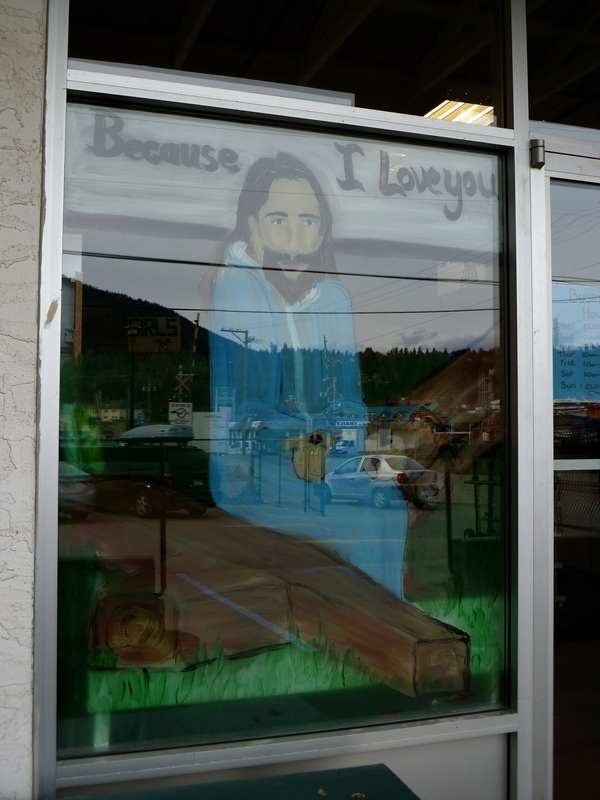 But it has an awesome painting on the window + I wondered, “Why do they have a painting of a homeless hippie sitting on the railroad tracks?”. Oh, it’s Jesus. Woops! Sorry Jesus! This place was like a opium den for thrift junkies. 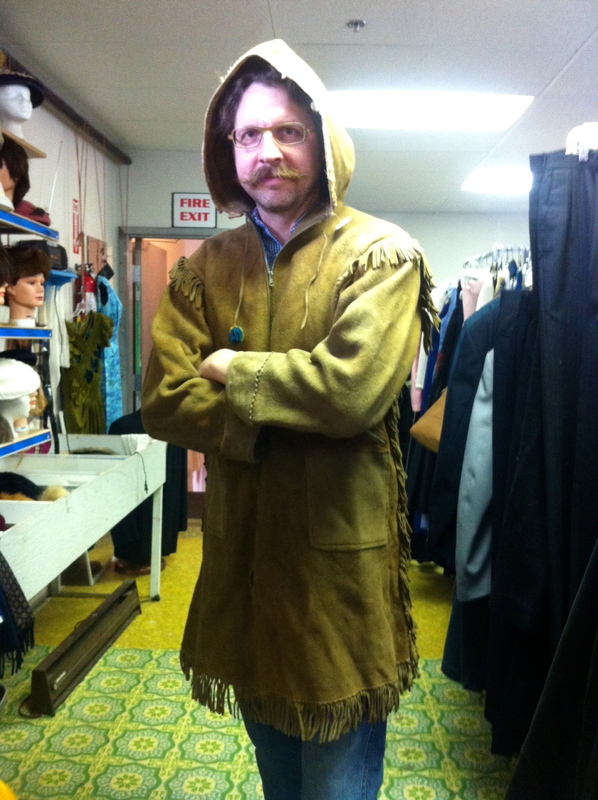 Look at this ahmazing period buckskin pullover hoodie!!! Get out of town!!!! Other prizes were, an Ecuadorian poncho, WWII coat, Mary Maxim sweater + others! Serious scores!!!! We were hiiiigh on life! Here’s another fantastic piece of art inside the store. 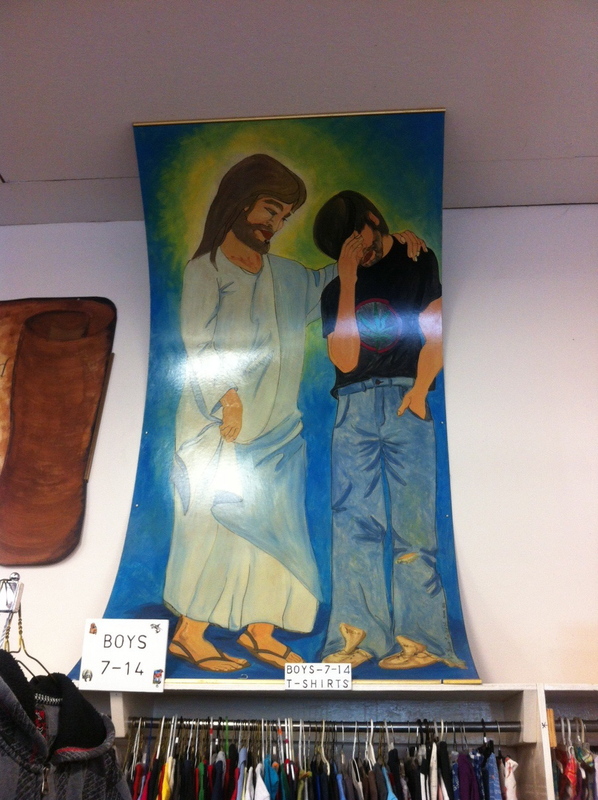 See Jesus comforting the sobbing, ashamed kid wearing a pot leaf t-shirt? Jesus is like, “It’s ok, man. It’s ok.”. Back on the road again. Unfortunately, all the picturesque views were on the drivers side. 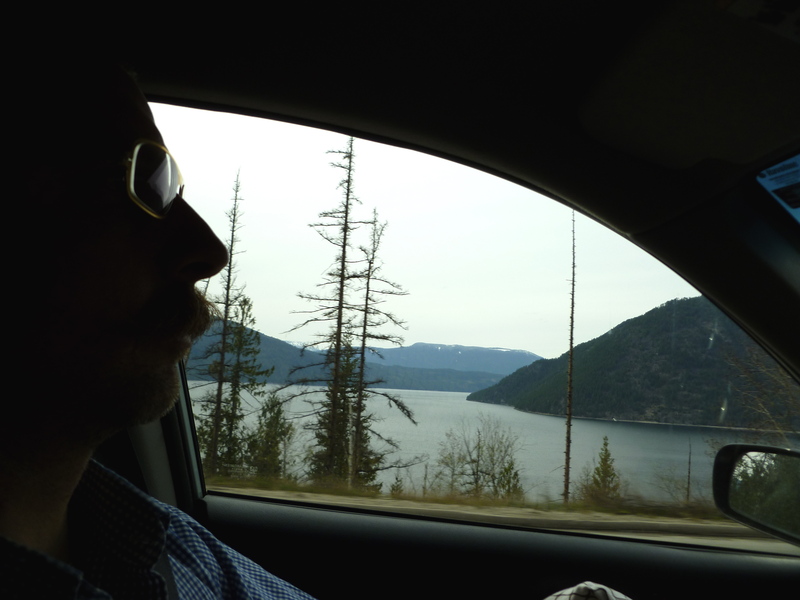 I could see a little bit of lake + a lot of moustache . 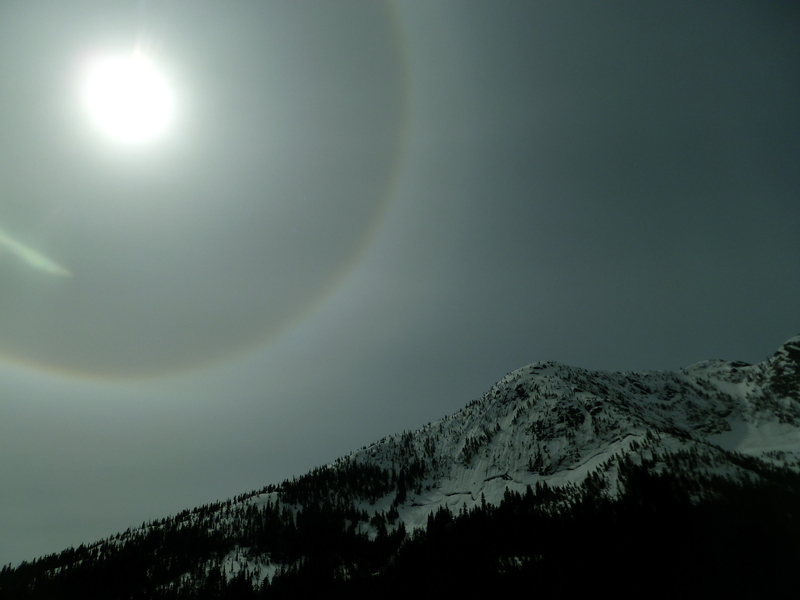 Jeff said the mountains were unusually visible + he shouted, “Get your camera ready! Take pictures! This is really something else!!!!”. I was like, “OK!!!! STOP YELLING!!!”. I was thinking about the 80 degree weather in Los Angeles + couldn’t believe what a different world I was in. I was awestruck at how beautiful it was. But beside me was a crazed man who drank too much Monster Energy Drink + was screaming a “Flight of the Conchords” song about David Bowie at the top of his lungs. So much for beautiful serenity. Alberta, we have arrived. Hope you enjoyed your travel! I’m excited to know what’s there to love in Alberta! And looks like you had a lot of fun taking photos of your hubby driver 😀 But seems he’s having more fun (read: last photo) Lol Thanks for sharing! Thanks for reading! Yes, I’m excited to learn about all about Alberta as well!!! Stay tuned!!! Oh Shelly – I love your blog so much! I can hear your voice in your writing and some of the material you guys find to write about just slays me – LOL! That Jesus painting is the cream of the crop! Haha!!! Thanks Liz! 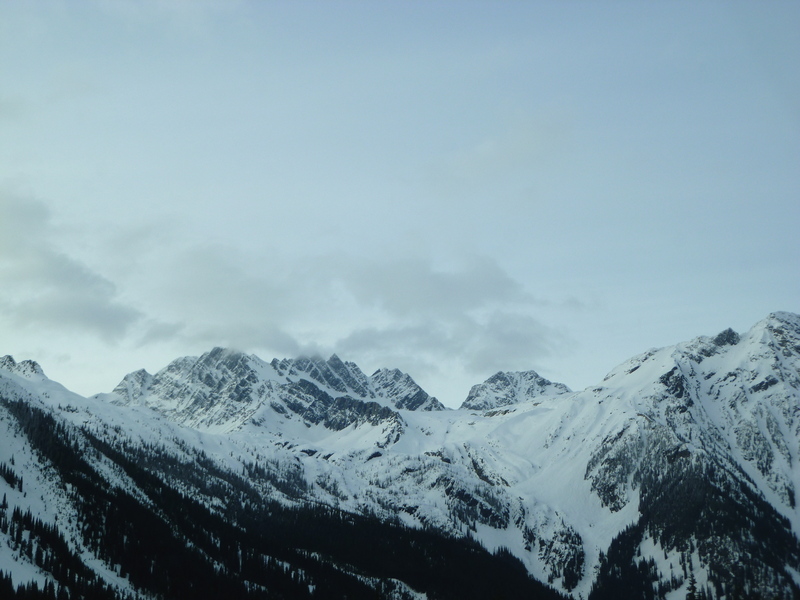 I miss Vancouver already….but I’m bound to find adventure in Alberta!!! XOXO!! !